Open to all Unattached Professionals and Conditional Members of any International Federation of PGA Tours and their affiliates (OWGR Tours). If after official re-shuffle a player loses Full Status, they are eligible to gain GLT National Membership. Tours included; PGA Tour Canada, PGA Tour Latinoamerca, PGA Tour China, Web.com Tour, European Challenge Tour. See Complete List of Tours below. National Members gaining full status on any tour listed below after re-shuffle or during any part of the season, will be downgraded to Basic Membership and will receive credit on the difference providing no CCPT events have been entered. GLT National Membership is open to any international professional including U.S. citizens. New members will be subject to a background check on previous playing experience and may require a letter of reference. Receive member discount on tournament entry fees. Includes Membership dues for Circuit Canada Pro Tour. 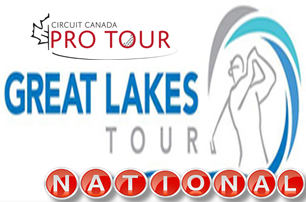 Eligible to qualify for Circuit Canada Pro Tour (CCPT) National and International Division events. Top 40 on National Order of Merit will gain entry into CCPT $175,000 Sani-Marc Canada Cup. Must have played 6 GLT rounds by July 27/19 to be eligible for second half CCPT events. Top 45 on National Order of Merit will gain entry into CCPT 36 Hole $50,000 purse events. Must have played 6 GLT rounds by July 27/19 to be eligible for second half CCPT events. ALL GLT National Members will gain entry into CCPT 36 Hole $40,000 purse events. Must have played 6 GLT rounds by July 27/19 to be eligible for second half CCPT events. Direct Access to Southern Ontario Open..
Gain access to member benefits until December 31 of current year.